Welcome to The Fool's Dog family of divinatory apps for iOS and Android devices! It's a new century for the venerable Tarot and its cousins, now appearing in pixels! Tarot art has never before been so vibrant! The cards glow from within. With The Fool's Dog family of divinatory apps, you can carry several decks on your phone or tablet. Each deck has fully integrated written material and a journal to keep track of your readings, presented with intuitive software and a simple user interface. 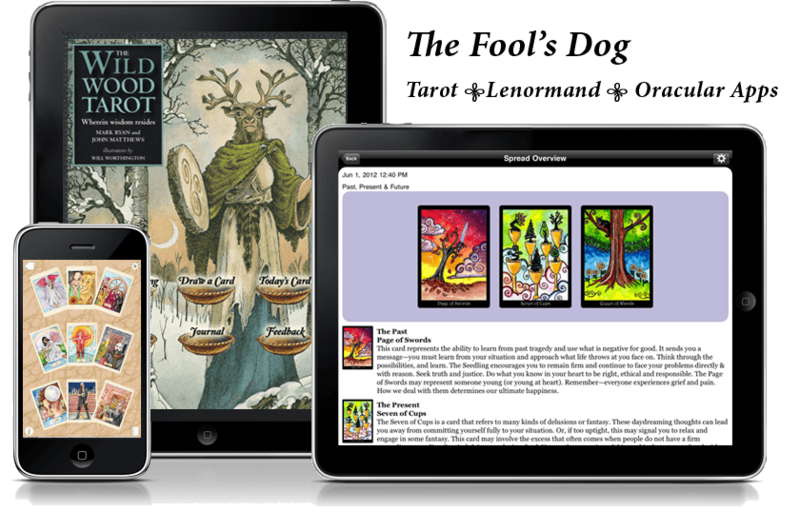 The Fool's Dog apps are wonderful Tarot teaching tools for beginners, and also include features designed for the needs of professional readers. © 2017 The Fools Dog. All rights reserved. The Fellowship of the Fool Tarot is copyright © 2008 by Helena Domenic. The Wildwood Tarot text is copyright © Mark Ryan and John Matthews 2011. The Wildwood Tarot card illustrations are copyright © Will Worthington 2011. The Wildwood Tarot is copyright © Eddison Sadd Editions 2011. The Tarot of Trees is copyright © 2009 by Dana Driscoll.